Killer Characters: Merry Christmas Wedding Murder! Bingo Denison from Denise Swanson's Scumble River mystery series tells all. My human, Skye Denison, has been extremely busy this Christmas season. I’m not a big fan of the holiday to begin with and I told her not to plan a wedding for the Saturday after Christmas, but did she listen to me? No! Now, besides the millions of last minute wedding details, there’s been a murder. I told her to let her fiancé, police chief, Wally Boyd handle the investigation, but once again, she ignored my good advice. What with the wedding and the murder, I’m really afraid she’ll forget to fill my Christmas stocking. I typed my wish list on her laptop, but she seems to have trouble reading it and actually scolded me for “messing up” a psych report she was working on at home. Skye’s life is so upside down, that even Mrs. Griggs, the ghost that lives in our house, hasn’t been harassing. Well, that is until Skye and Wally got too friendly, then Mrs. Griggs sent in the dogs—at least I think that big ugly thing was a canine of some sort. I hope once the wedding is over and Skye and Wally are back from their honeymoon things will calm down. I’m not sure how I feel about another guy moving into my house, but so far, Wally has been cool. He cleans my litter box and feeds me the good stuff, not the dry crap Skye tries to give me. If Wally continues to behave, we should get along just fine. How do you feel about Christmas? Would you plan a big wedding for a few days after the holiday? 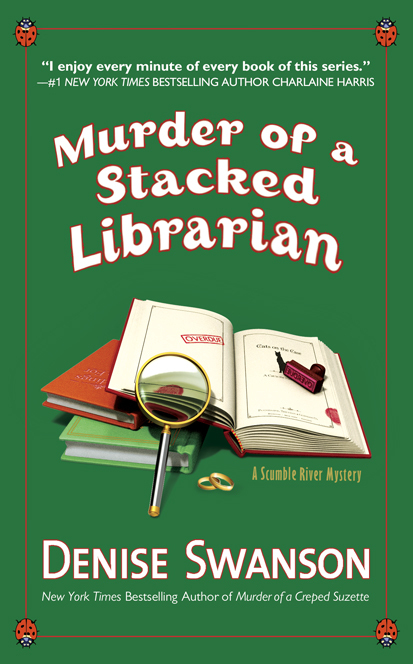 As part of Killer Characters' "Season's Readings," I'll be picking a winner to receive either Murder of a Stacked Librarian or Nickeled-and-Dimed to Death—your choice. Please leave your email address with your comment. PS From Bingo. My friends Banshee and Tsar—a Siamese and Russian Blue cat who live in Shadow Bend, Missouri wanted me to let you know that their story is coming in March. It’s called Dead Between the Lines a Devereaux’s Dime Store Mystery. A book club invites an author to speak and someone doesn’t make it home from the meeting alive. New York Times Bestselling Author Denise Swanson writes the Scumble River and the Devereaux’s Dime Store mystery series. Definitely wouldn't plan a wedding around Christmas. Christmas isn't my favorite holiday. Too much expectation on all fronts with a depressing letdown when nothing goes as planned or anticipated. I guess it depends on your family, but Fall would be a great time for a wedding or early Spring....Christmas is just too busy and hectic and people are too short temper wise. Sounds like a really good read though! I would not plan a wedding around the holidays. Too many other occasions to celebrate at that time that I'd like to spread it around a little. My pick would Nickeled-and-Dimed to Death, though Murder of a Stacked Librarian would be great, too. A Christmas wedding does sound rather magical and romantic, but there is all the stress and chaos of the two big events combined. And as someone whose birthday is close to Christmas, I know how the holidays can take away from that. Each should have their own special time. Stories with ghosts are attractive to me....as long as it is a friendly ghost!!!! I would'nt mind a ghost buddy...around here..! I wouldn't plan anything around a major holiday. Christmas and a wedding--fun and crazy all at once! Christmas, murder and a wedding! WOW and I thought my holiday is CRAZY! Hey, if he's willing to scoop the litter box, he's a keeper! I definitely would not schedule a wedding around the holidays! I wish my cat (Junior) could talk to me. ;) I haven't had time to read the latest book so I would be very happy to win. Gathering family and friends together is one of our traditions. I really have to make time to read this series - maybe after the first of the year. I would not be planning a wedding around the holidays!! I would not plan a wedding anytime around the holidays. There is already too much to do without that, too! I wouldn't want a wedding near Christmas. There's too much Christmas prep to even consider wedding prep. Plus, I like my big celebrations (and the anniversary would be one) spread out. That's one reason I love that my birthday is June! I hope you get some nice Christmas treats Bingo! My pick would Nickeled-and-Dimed to Death. I wouldn't plan a wedding, but I am doing something almost as bad. They started today putting down wood floors. They were supposed to be done in Sept. but were delayed because they couldn't get the wood because of the wet summer. they will have mu house torn up for the next two weeks. My husband wanted to get married at Christmas, but I was glad that I could not get time off from work for that to happen. One month later was close enough for me. We got married the day after Thanksgiving, and that was a good time.That was 40 years ago. I would like Murder of a Stacked Librarian, thank you! We had planned a wedding for July 5 which is the day after the 4th. We did have that wedding but we also had a civil ceremony early. Even though we were over 30, our parents did not like us being alone, so we decided to have a District Justice marry us. I wouldn't plan a wedding for Christmas time but I've been to a wonderful one on New Year's Eve! 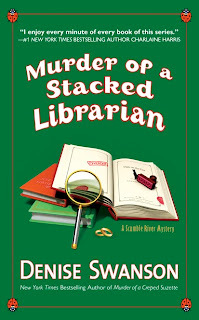 I've read Murder of a Stacked Librarian - loved it! If I should be so lucky as to win I'd like Nickeled-and-Dimed. Haven't read any of your books yet. I love cats. A wedding in the summer is good. My birthday is in June so I like summer. One good thing about the timing would be that a lot of the family would already be gathered. I think it was brave of Skye to plan a winter wedding in IL - just from the snow factor! I had a summer wedding myself, mostly because I love the summer! I'm glad to hear that Wally slips Bingo the good stuff, LOL! No I would not plan a Wedding around Christmas. I don't think the wedding would get its full attention with all the Holiday activities going on and a lot of people wouldn't be able to attend if they were traveling. After Christmas would be a better time for a beautiful winter wedding! Everyone is kind of let down a little when the holidays are over and would probably truly enjoy something to look forward too then! Loved Bingo's note! I'm always so busy during the holidays--I can't imagine planning a wedding for that time, too!! I think Christmas Eve is the perfect time to get married. I always wanted a white velour wedding gown with red velour bridemaid dresses. I felt only your true friends would attend - I'm not fond of crowds! If I could be guaranteed a beautiful white snowfall for my wedding, then it would be worth it. Otherwise, it would just be a cold and miserable wedding. Love reading about a Christmas wedding/murder, though I wouldn't plan one for myself!! I'd rather go to a wedding than have one but I think a Christmas wedding would be pretty.